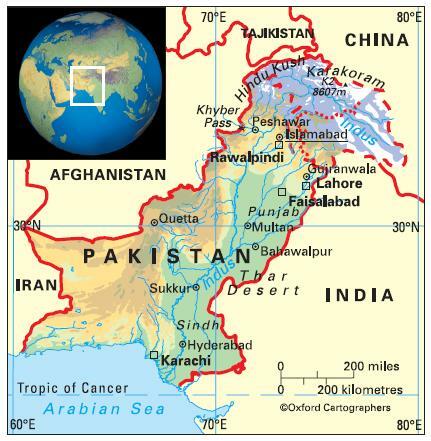 Pakistan lies just north of the Tropic of Cancer, bordering (clockwise from west) Iran, Afghanistan, China and India. The Arabian Sea lies to the south. The country comprises four provinces: (from south to north) Sindh, Balochistan, Punjab and Khyber Pukhtoonkhwa (formerly North-West Frontier Province). The territory adjoining Khyber Pukhtoonkhwa is known as the Federally Administered Tribal Areas and the Pakistani-administered parts of Jammu and Kashmir in the north-east as Azad Kashmir and Northern Areas. Extreme variations of temperature. The northern mountains are cold, with long and severe winters. Temperatures on the Balochistan plateau are high. Along the coastal strip, the climate is modified by sea breezes. In the rest of the country, the temperature rises steeply in summer. Seasons are: cold season (December to March), hot season (April to June), monsoon season (July to September) and post-monsoon season (October and November). Rainfall varies from 760-1,270 mm in the Himalayan foothills to 210 mm in Balochistan. The most significant issues are soil erosion, deforestation, desertification, and water pollution with untreated sewage and industrial waste and through the use of commercial pesticides. 179,160,000 (2011); density varies from more than 230 people per sq km in Punjab to 13 in Balochistan. Some 37 per cent of people live in urban areas and 18 per cent in urban agglomerations of more than a million people. The population growth rate stood at 2.2 per cent p.a. between the years of 1990 and 2012. In 2012 the birth rate was 26 per 1,000 people (43 in 1970) and life expectancy was 66 years (54 in 1970). The population comprises Punjabis (44 per cent), Pashtuns (15 per cent), Sindhis (14 per cent), Saraikis (11 per cent), Muhajirs (7.6 per cent), Balochis (3.6 per cent) and other smaller groups including tribal groups in the more remote northern areas. Pakistan is classified as a lower-middle-income economy by the World Bank.